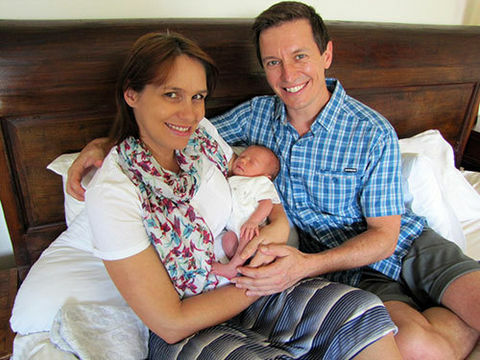 Comedian and television host Rove McManus, and his wife, actress Tasma Walton, welcomed their first child on December 16, and have named their daughter Ruby Aurelia. Ruby McManus weighed 2.74 kg (5lb 4oz) at birth. John, nicknamed “Rove”, has been a stand-up comedian and television presenter since the 1990s. He gained his own variety show, Rove, in 1999, which changed its name to Rove Live and switched from Channel Nine to Ten the following year. The show featured weekly celebrity guests, local and international comedians, and live bands, and proved extremely popular. After Rove’s wife, actress and singer Belinda Emmett, died from breast cancer in 2006, he took a break show, but returned in 2007, with the show revamped, and the name changed back to Rove. He also became host of the Australian version of the game show, Are You Smarter Than a Fifth Grader? Rove several times appeared as a guest on NBC’s The Tonight Show with Jay Leno, and now has a regular spot on the show. In 2008 he made his debut as host on American television, by hosting an American Broadcasting Special called The List. In 2011, he relocated to Los Angeles to host Australian programme Rove LA, broadcast on Fox8, which is also seen in the UK, New Zealand and the US. His production company, Roving Enterprises, produces current affairs show, The Project, and the AFL comedy panel programme, Before the Game. Rove has won 16 Logie Awards, including three Gold Logies and seven Silver Logies. Tasma began in theatre, and has had regular roles on Home and Away, Blue Heelers and City Homicide. She has also appeared in Water Rats, Sea Patrol, BeastMaster, The Secret Life of Us, White Collar Blue, McLeod’s Daughters and Stupid, Stupid Man. She has had roles in several films, most recently Mystery Road, which was released this year. In 2009 she brought out her first novel, Heartless. Tasma and Rove were married in a beach ceremony in Broome in 2009, and are based in Los Angeles.